Router and Switch Market size is projected to exceed USD 41 billion by 2022, growing at a CAGR of 2.9% from 2015 to 2022. Proliferating implementation of cloud computing solutions is anticipated to drive the industry demand. The swift in technology form hardware based solutions to software solutions offers flexible and application-driven customization of network infrastructure. 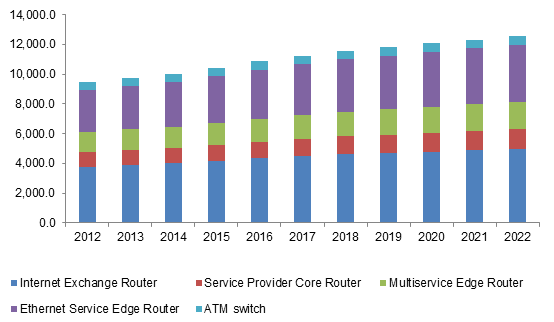 Ethernet service edge router and switch market size was valued at USD 9.6 billion in 2014 and it is forecast to reach USD 12.6 billion by 2022. BYOD market growth should act as a vital factor for network security enhancement owing to which companies are now increasing their IT budget. Proliferating usage of mobile as well as other electronic devices at work implies the need for network security in order to tackle risky situations. In addition, BYOD offers various benefits such as cost reductions, better productivity and employee satisfaction which are anticipated to fuel the industry demand. Numbers of mobile devices are rapidly increasing as operators deploy faster networks. Hence, mobile data traffic is expected to explode over the forecast period. The surge in the industry is can be subjected to growing number of wireless devices, smart phones and deployment of sophisticated network such as 3G, 4G and LTE. IP networks are very large scale networks, thus failure in the network might cause huge trouble. This might act as challenge router and switch market growth. Rising awareness about IP TV, carrier Ethernet as well as multiservice networking is anticipated to furnish huge growth opportunities. Internet exchange router acts as building block of internet. It is expected to accumulate more than 40% of the overall industry and exceed USD 16 billion by 2022. Service provider core router was valued over USD 3 billion in 2014 and is likely to grow at a CAGR of over 2.5% from 2015 to 2022. This industry surge can be attributed to high efficiency, less power consumption and optimized rack space usage for better bandwidth capacity offered by the system. Internet data center valued over USD 12 billion in 2014. It is estimated to grow at a CAGR of over 3% from 2015 to 2022 due to numerous benefits offered such as enhanced power and space access. BRAS (Broadband Access Aggregation) accounted for more than 27% of the overall market share in 2014. It is expected to exceed USD 11 billion by 2022 growing at a CAGR of over 2.5% during the forecast period. The surge can be subjected to growing demand for high speed services namely digital audio, video-on-demand and multiplayer gaming. North America router and switch market share was valued over USD 12 billion in 2014. It is projected to be valued over USD 15.5 billion by 2022 growing at CAGR of over 2% from 2015 to 2022 owing to significant rise in backhaul investments in the region. Asia Pacific accounted for more than 25% of the overall industry share in 2014. China router and switch market size is estimated to reach USD 4.8 billion by 2022. The growth can be subjected to propelling demand for multi-screen delivery and high-definition content. Router and switch market share is highly consolidated by top five industry participants, accounting for more than 94% of the overall industry share in 2014. Cisco Systems accounted for 67.5% of the overall industry share in 2014. Other Key industry participants include Alcatel-Lucent, Juniper Networks, Huawei Technologies, and ZTE Corporation among others.